1. Preheat the oven to 200°C, gas mark 6. 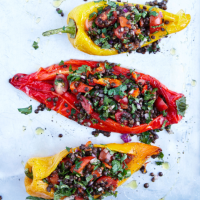 Pierce the skin of each pepper and toss them all with 1 tbsp olive oil. Put on a large baking tray and roast for 20-25 minutes, until well coloured but still holding their shape. Set aside to cool slightly. 2. Meanwhile, combine the remaining ingredients in a bowl; season. Peel off and discard the skin from 1 pepper and chop the flesh, discarding the seeds. Stir into the lentil mixture. 3. Carefully make a cut in each of the remaining peppers, running from top to bottom to open them out. Scoop out and discard the seeds, then transfer to a serving platter and spoon in the lentil mixture.